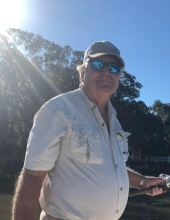 Larry Allen Driggers, 68, passed away Thursday, February 7, 2019 at Ogeechee Area Hospice Inpatient Center in Statesboro. He was born January 15, 1951 to Coy and Nina Mae Smith Driggers and lived in this area most of his life. He was employed with Griffin Contracting as a road construction foreman. He was avid outdoorsman and enjoyed, hunting, fishing at the coast being with his family and friends. He is a member of Beards Creek Primitive Baptist Church. Numerous cousins, nieces and nephews also survive. Visitation will begin at 5:00 pm, Sunday, February 10, 2019 at Brannen Kennedy Funeral Home. Funeral Services will be held 11:00 am, Monday, February 11, 2019 at Beards Creek Primitive Baptist Church with Elder Summerford officiating. Burial will be in Glennville City Cemetery. To send flowers or a remembrance gift to the family of Larry Allen Driggers, please visit our Tribute Store. "Email Address" would like to share the life celebration of Larry Allen Driggers. Click on the "link" to go to share a favorite memory or leave a condolence message for the family.